The cache is not at the coordinates above but you will need to visit the village sign which can be found here and answer a few questions. There are a number of different images depicted each of which represents a part of the village's history. The word Thursford is believed to be a legacy from Scandinavian invaders meaning a sheltered valley and river. The flag of Saint Andrews is a reminder of the church where the inhabitants of Thursford have worshipped through the ages. The church stands in the park in sight of the once handsome Tudor mansion which was sadly sold and dismantled brick by brick in 1918, leaving only the Elizabethan wing remaining today. 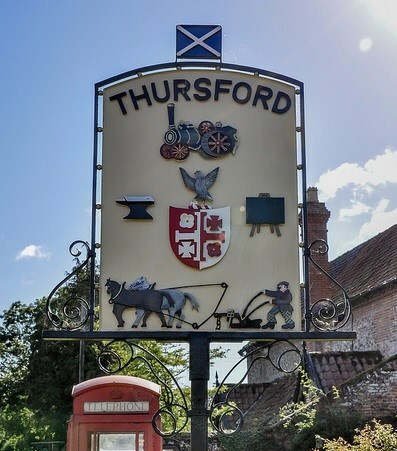 The coat of arms in the centre of the sign belongs to the Chad who lived and resided in the hall until 1917 and owned not only the village but also land in the neighbouring villages the then Thursford Hall Estate. Steam has always played a part in the village with the threshing machine business owned by the Bushell family since 1899 and employing 24 men at one time, serving the farms in Thursford and the surrounding villages, until the advent of the modern combine. George Cushing introduced more steam into the village when he started his road rolling and contracting business. He was captivated with all forms of steam and this is reflected in the local museum. The anvil is in memory of the Blacksmiths forge which was the central hub of the village but eventually closed its door in the 1960’s. The blackboard and easel represent the three schools that have been in existence in the village over the village years. The Ploughman is a vivid reminder of the many men who toiled all weathers and devoted their lives to the land, and who worked on the then ten farms in the village. The M& G’N engine represents the railway which came to the village amid great excitement in 1883, bringing employment and prosperity only to close down some 76 years later in 1959. At the height of the railway’s prosperity Thursford was one of the busiest stations in North Norfolk with special trains transporting cattle and the vast amount of sugar beet brought in from the surrounding villages to be processed at Kings Lynn The coal trains also brought the coal direct from the mining areas for delivery in the surrounding villages. The tree represents the fine specimens that graced the parkland. Until the mid 1800’s Thursford was mainly heath, common and woodland, therefore the tree represents this period of the Enclosure Act of Parliament when the land was then reclaimed and cultivated. In the days of horse transport and weary travellers hostelries for refreshment were to be found on the three entrance roads to the village. At a much earlier date, a beer house was also situated in the centre of the village. The horse and wagon again represent the main industry of farming and the lives of most of the villagers over the years. In both cases the fords are bridged over today, known as Wades Beck on the Little Snoring Road, and the other on the Fakenham Road at the bottom of Brook Hill. The lime kiln was in operation until 1925 turning out lime for building and fertilising the land. This was a flourishing business when Mr and Mrs Lee came to the village and occupied the Lime Kiln Farm in 1913. The large crater is all that is left on the farm as evidence today of this one time active kiln. The information you need to locate is at the base of the sign. You are looking for a custom cache. Tweezers may be needed and you will need to bring your own pen. Watch out for muggles.